Dr Gary, the situation is as follows: When the larvae are about to emigrate from the substrate, if I am correct they empty their digestive tract, a leachate is produced that is toxic to them, if we do not have an alternative to evacuate this , Produces much death in larvae. Can this be corrected with a feeding schedule of 90 to 100 mg larva per day? 90 to 100 mg larvar per day? 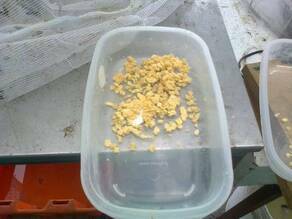 I am producing soldier fly larvae in large volumes, but I have noticed that leachate is toxic to them, so a drainage must be installed. I had the experience of feeding larvae with a mixture 70/30 molasses / molasses, being toxic for these, since they all died. 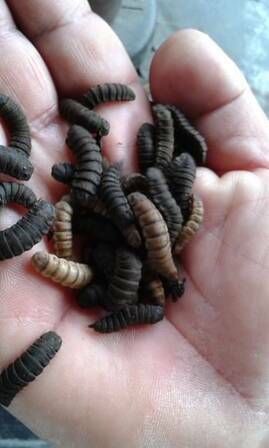 We are producing larvae for obtnecion flour and make bacteriological and nutritional quality analsis in our country has not worked this productive row, but I think they should have the same parameters of bacteriological quality of meat meal, blood and viscera . Using damp floor gallinaza 1: 1, also fresh pig manure scraping. 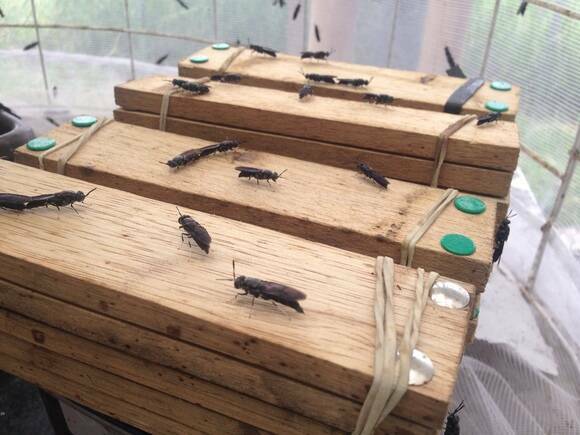 Getting energy sources on the farm is easier than protein and a protein concentrate and soy is difficult, the larva of housefly and fly larvae soldier for its high protein content are a viable alternative for small producers, we are to evaluate a diet soldier fly larvae and sugar cane juice.